Over the last two weeks I have received several calls/emails regarding interpretation of plant analysis results. In all situations, the agronomist asked how it was possible for corn plant sample results to come back saying that many nutrients were deficient or would be responsive to added fertilizer. One specific example had optimum or better soil test levels and a spring application 14,000 gal/a of dairy manure. Kind of hard to believe that V5 corn would be limited by N, P, S, Ca, Zn, B, and Mn in this situation. Lab results had been interpreted using guidance developed by an ag inputs company. I evaluated the lab results using the UW plant analysis interpretation guidelines. The agronomist and I were not certain how tall the plant was when sampled or what plant part was sampled (a third party agronomist sampled the field). Nitrogen and P were borderline deficient assuming that the plant was 12” tall or smaller and the whole plant was sampled. If the plant was more than 12” tall and the youngest leaf with collar exposed was sampled, then all nutrients were sufficient. A very different interpretation using UW plant analysis guidelines. The agronomist collected another tissue sample when the crop was at V7 and sent it to a lab that uses UW plant analysis interpretation guidelines. The crop was sufficient or high for all nutrients. I plan to follow up on this field after harvest. Key points for plant analysis. Nutrient concentrations in the plant vary during the growing season and also vary among plant parts. Interpretations of nutrient sufficiency ranges were developed for specific growth stages and specific plant parts. Erroneous interpretations can be made by sampling the wrong part of the plant and/or sampling at the wrong growth stage. Based on questions I receive, plant samples are often collected improperly, especially for soybean. Plant nutrient uptake is influenced by location, hybrid/variety, soil test levels. Samples collected from several hybrids/varieties growing in the same field will have a range of nutrient concentrations in the plant. The same hybrid/variety grown on several fields with the same soil test levels will have different nutrient concentrations within the plant. The same is true if soil test levels varied among fields. Thus, nutrient concentrations just below the sufficiency range are not always limiting yield. The concentrations may just be part of natural variation. The sufficiency range is a range of nutrient concentrations that are considered adequate for high yields. Ideally, sufficiency ranges are developed through research that includes field trials where nutrients are or are not applied and yield is measured. Sufficiency ranges developed through surveying nutrient concentrations are limited because it is unknown if addition of nutrients would have resulted in greater tissue nutrient concentrations or yield. Sampling a field that looks good in an effort to find “hidden hunger” that is limiting yield is not suggested because of the points listed above. Plant analysis is best used when samples are collected from “good” and “bad” areas of the field along with soil samples collected from the same areas. The comparison of results along with field history information is very useful to understanding the problem in the field. The correct plant part and growth stage at which to collect samples along with UW plant tissue sufficiency ranges for alfalfa, corn, soybean, and wheat, are provided in Tables 1 and 2. Please note that Wisconsin Department of Ag, Trade, and Consumer Protection certifies soil test labs, but they do not certify plant analysis labs. What this means is that each lab is free to interpret plant analysis results as they wish. The UW Soil and Forage Analysis Lab in Marshfield (715-387-2523, http://uwlab.soils.wisc.edu) interprets plant analysis results as described in Tables 1 and 2. Table 1. 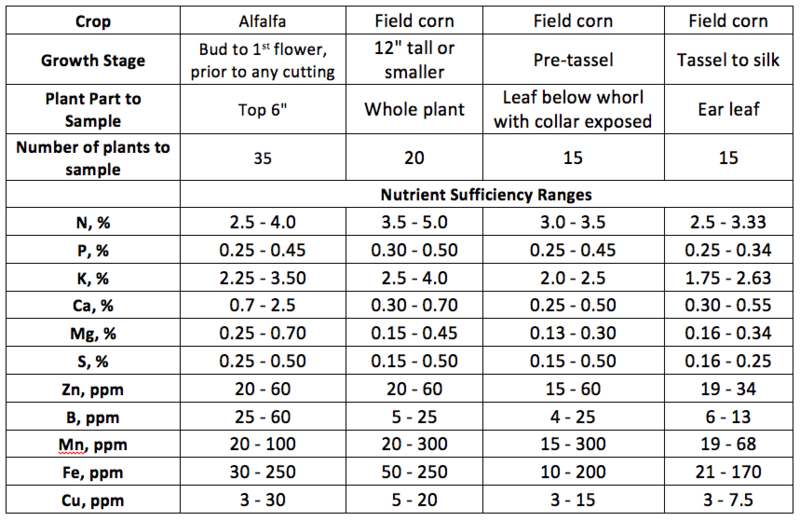 Plant sample collection guidelines along with UW plant tissue sufficiency ranges for alfalfa and corn. Table 2. 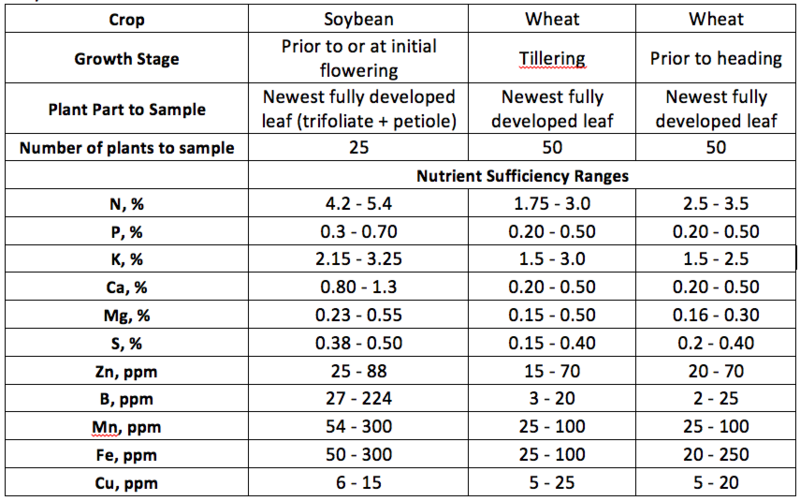 Plant sample collection guidelines along with UW plant tissue sufficiency ranges for soybean and wheat.